Mentorship throughout one’s career is essential for leadership growth and development. Mentors Corner is meant to provide resources to entrepreneurs interested in learning from seasoned business professionals as it relates to the topics of finance, law, business development, sales, marketing and brand development. Every month, Mentors Corner will provide tech industry insights, feature expert advice from local business leaders, and provide contact info enabling founders to pose questions to expert mentors. Mentors Corner will also feature highlights from the Post Accelerator Network (PAN) Meetup which takes place in both Munich and Berlin, and Munich Startup’s founder/mentor get togethers throughout 2016. Last week, INSEAD, the business school for the world, and 500 Startups, a global venture capital seed fund and startup accelerator based in Silicon Valley released ‘#500 Corporations: How do the World’s Biggest Companies Deal with the Startup Revolution?’ The report focuses on corporate innovation by investigating 500 of the world’s biggest public companies and their practices in terms of Corporate Startup Engagement (CSE). In summary, ALL companies across various industries have been challenged by startups. This challenge presents new opportunities for startups to join forces with corporations. 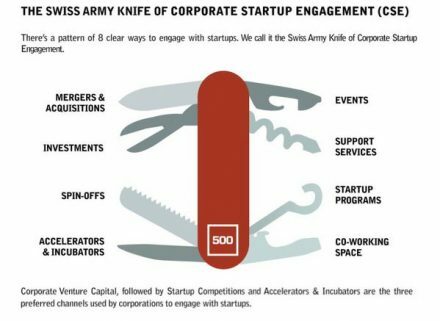 • 68% of the top 100 companies from the Forbes Global 500 are engaging with startups. • The majority (61.7%) of the Unicorns (private companies valued at US$1 billion or more) mentioned by The Wall Street Journal under The Billion Dollar Startups Club have raised funds from at least one corporate (not including investment firms and banks). The above statistics demonstrate the effort that corporations are making to work with and invest in startups, as well as the fact that startups are keen on the idea. It is my belief that engaging and investing isn’t enough for a successful union between the two. Both parties need to take time to get to know how each does business. Startups are known to be agile and make decisions on the fly, but corporate entities have processes in place that have kept them standing for years. The way each entity conducts business is effective given the environments for which they serve. The recipe for true success between both parties lies somewhere in the middle. Compliance, finance, human resources and marketing departments of corporations would benefit from a more simplified approval process and startups could benefit from a more structured process. We are all quite familiar with mergers and acquisitions, investments, accelerators/incubators, startup programs and co-working spaces. When two entities who are so different want to work together, more attention should be paid to exactly HOW they can work together. Investments and three month accelerator programs are not enough. After the investment and/ or accelerator program, what is next? Mentorship, events and other support services are key to both parties being more inclusive of each other. Startups can educate corporates and corporates can educate startups on how to build businesses that will last both physically and virtually. 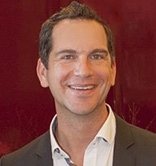 Stefan applies international insights to provide pragmatic and strategic legal advice. He has been a lawyer for 15 years and specializes in IT and IP (Fachanwalt). Stefan studied in the UK and has worked in New York City. In addition to his legal studies, he has a strong technical understanding of technology from his former activities as a programmer, and is up to date on latest technologies and market trends. He uses these skills to “translate” between legal, technology and common understanding. In his daily work, Stefan assists national and international firms in understanding their legal situation and in finding working solutions for businesses. His practice includes the development of legal solutions for advanced digital projects and strategic product and trademark portfolio management. He focuses on legal topics spanning the areas of IoT, data protection, consumer rights, advertising, open source software, trademark protection, unfair competition, and contract drafting. Stefan is a member of the board of ITechLaw and Vice-President of the German Federal Association for Online Service Providers (BDOA). He holds an LL.M. degree. Advice to Startups: Protect your Idea! Join Stefan and other founders on February 17, 2016 as he provides information on How to Protect you Idea. Register here. If you have questions that you would like to ask Stefan or questions relating to your startup please send an email and we will address these inquiries via Mentors Corner, PAN, or Munich Startup monthly gatherings for founders. Wilhelmina Jewell Sparks is a biologist turned business development /strategy expert who has worked in both corporate and startup environments in across the globe. She has an MBA in strategic planning, global markets and corporate communications. During the majority of her career, she has strategically positioned and launched innovative products and services for industry and startups in the areas of: biotech, software technologies, electronics, digital health, fashion, entertainment, foodtech, agtech,wearables and IoT. Jewell currently resides between Berlin, Dusseldorf and Munich and has been focused on “minimizing barriers to entry” and cultivating inclusion factors for women, minorities and EU founders in both startup and corporate eco-systems. Jewell is currently the Global Head of Innovation Scouting and Inclusion for Metro AG – Business Innovation and the Founder of BiTHOUSE. The Post Accelerator Network (PAN) Meetup takes place every other month in Munich.Have you participated in an accelerator program? Are you still seeking mentorship, strategic partners and/or investment? PAN provides you with mentorship, workshops and exposure to the right networks in order to help you with your startup venture. Network and collaborate in order to scale your startup and continue your learning process while connecting with strong global leaders. Sign up here. Powered by BiTHOUSE, Metro AG – Business Innovation and Munich Startup.